So, I went for a polysomnography (sleep study) a few months ago, and got all hooked up to monitoring equipment. The wires all went through a control box which I wore on my chest before bed. Not to mention the CPAP mask and hose the second night. Now, I wear one of these at night. I just recently watched Alien for the first time. 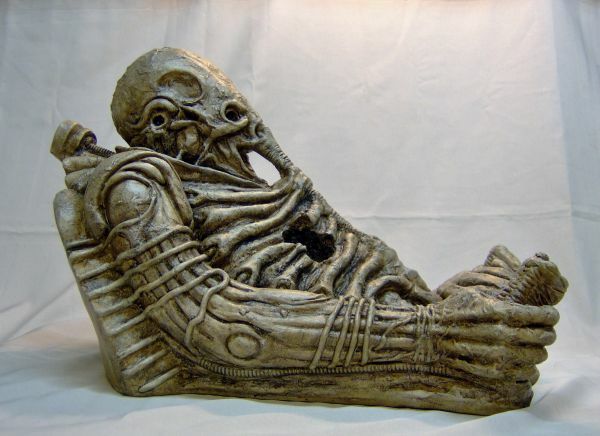 I think the "space jockey" just had sleep apnea. Last month we took the kids to Holiday World in Santa Claus, Indiana. There's a ride there called the "Wildebeest," which they call "the world's longest water coaster." This certainly made an impression on some of the kids, despite the fact that I pointed out that I'm not sure there are any other "water coasters" in the world. But anyway. Our second day at Holiday World and Splashin' Safari was our day to hit the water rides. It was 68 degrees and cloudy, but it was our chance. I decided to ride the Wildebeest with the three kids who wanted to ride. On this ride, four people ride on a longish inflated raft/boat/thing, each with their feet extended forward under the arms of the next person in front of them. Except for the person in the very front--his feet are extended beyond the front of the raft and crossed at the ankles. Now, I didn't want to be in the front. But neither did either of my daughters or my 9-year-old son. So, time to man-up. I took the front position. Because I'm the dad, that's why. The ride takes each raft up a long inclined conveyor belt to the top, like a roller coaster. Then your raft is propelled through tunnels (some open, some closed and dark) with flowing and spraying water. There are additional rises and falls, as with a roller coaster. We screamed, as with a roller coaster. There I was, putting my feet out in front of the raft in which the four of us were being hurtled in directions unexpected through tunnels toward obstacles unseen. With my feet sticking out front, first point of impact. Now, as I told the kids I would take the front spot in the raft, I told them, since none of them wanted to, that I would because I'm the dad. I also told them, after the experience, that I would get to use that same reason several more times over the course of our trip, as it suited me. Which I did. This all got me to thinking. Why did I take the front position in that raft--the scariest spot? Because I'm the dad, that's why. Why have I crawled under our house to fix a leaky pipe? Because I'm the dad, that's why. Why do I at least try to go to bed at a decent hour and make it to work on time most mornings? Because I'm the dad, that's why. Now, I don't list these tasks as if they are particularly monumentous or glorious achievements (Nobody shoots at me or blows up cars when I drive by, that's for sure). I list these things I do--the unpleasant and tiresome tasks--because by and large I don't think I'd do many of them if I weren't the dad, that's why. If it were just me counting on me, I probably wouldn't bother. But it isn't just me: it's my wife and our five children depending on me. And that responsibility has driven me to do good and valuable things that I may not have done otherwise. The responsibilities of fatherhood have pushed me to do things. Maybe not heroic things, maybe not things that take much bravery or skill or strength. But they take more bravery, skill and strength than I would have bothered finding out I had, if I weren't the dad. "First, the Square Deal from T. Roosevelt. Then, the New Deal from F.D. Roosevelt. Now, the Big F****** Deal from B.H. Obama." As most know, a car insurance policy doesn't obligate the insurance company to repair damages sustained before you took out a policy with them. Most people are acquainted with this and understand the reasonableness of this practice. What if we ask the same question about health insurance instead of car insurance? It is my understanding, from what the president has said in interviews (http://www.foxnews.com/printer_friendly_story/0,3566,589589,00.html), that his healthcare reform proposal (the actual text of which I've been unable to find) would require that health insurers allow me to purchase heath insurance which would compel them to pay for pre-existing conditions. Insurance is about transferring risk. I pay the insurance company to assume a certain defined risk (whether the risk of me wrecking my car or contracting swine flu, depending on the insurance). If it isn't risk, but a known past event, why would they take that on at a known loss? I think of it as a wager or bet: I bet I'll get sick enough someday to need more medical care than I can pay out of pocket at the moment. The insurance company is betting that most of the people to which they sell insurance will stay healthy at any given time. The premium I pay every month balances the odds between us, to mutual benefit. My premiums over the course of a year are less than the cost of health care I'll need over the year if I stay healthy, and are far, far less than the cost of health care I'll need if something catastrophic happens. Now, there are a zillion factors (malpractice suits, the ubiquity of health insurance insulating patients from the real prices, etc...) which skew the prices of health care from being as affordable as they could be, which in turn raises the cost of insurance premiums. On top of that, many of the current laws and regulations on health insurance server to limit consumer's choices and allow prices to inflate. But what about situations where health insurance companies will cover pre-existing conditions if the applicant can prove he's had continuous health insurance coverage for some specified amount of time? The exception to the pre-existing condition exclusion for someone with continuous coverage makes sense to me: It's unlikely that such a person is buying health insurance only after they've found an issue (when they've already had the wreck, in car terms). This arrangement removes the incentive to avoid having insurance until you know you have a medical condition. So, if a woman who is already expecting, and knows it, wants to buy insurance to cover the expenses of prenatal care and childbirth, should the insurance company be required to sell such a policy to her? Let's say the prenatal care and birth will cost about $10,000 (That would probably be a bargin, but it's easy for me to calculate. This is also assuming no c-section). Selling her this policy means that the insurance company knows they will be spending at least $10,000. So, for it to make any sense for them, they would need to charge at least that much in premiums from her over the remaining months of the pregnancy. Say she's 2 months along; that leaves 6 months. Premiums would need to be $1,667 per month for the insurance company to break even. If she could pay that, why would she need insurance? She could just pay the doctors directly. Now, what if on top of this the government sets limitations on insurance rates? Let's say the government arbitrarily says "no woman ought to have to pay more than $500 a month for insurance to cover maternal care." In this case, the max the premiums would bring in would be $3,000, while the expenses will be at least $10,000. What if she waits until later in the pregnancy? In fact, why wouldn't she wait until later, since they have to cover her anyway? If those are the laws, why would any health insurance company continue to operate? They'll all shut their doors and we'll all be on the government plans. I suspect that's the goal, anyway. Interesting goal-achievement tool: "Don't Break the Chain."